Wow. A lot of time has passed since the last post. I have been busy though. I have built the bones of an ARM-based game console. I'll describe how I got to this point (a pointless spinning cube) over the last one and half years of sporadic effort. Firstly, though here are my influences. You should certainly check out these amazing projects - they might inspire you to go down this crazy path. Originally I wanted to build a Z80 based computer with nice 8-bit AVR based GPU - a software GPU. The idea for the GPU came after reading about the Lazarus64 project. 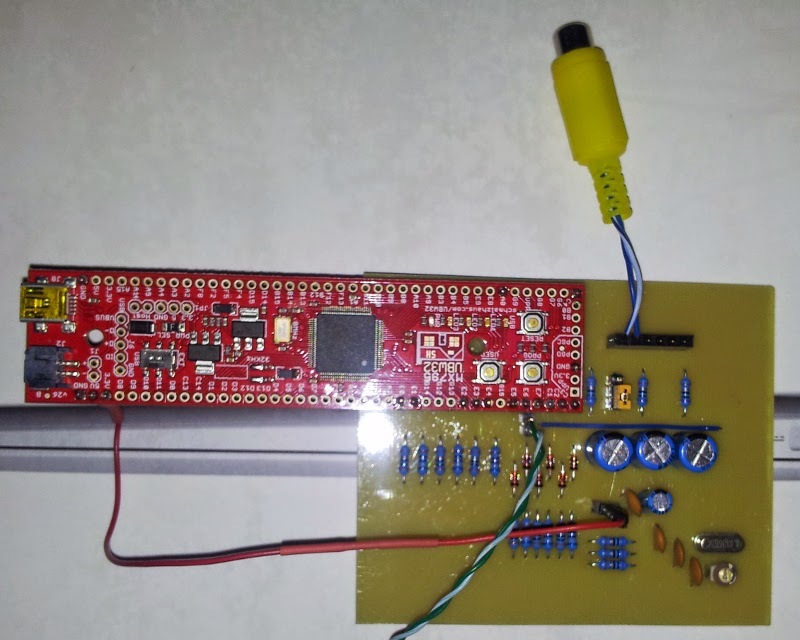 Brad (from LucidScience) managed to breadboard an ATMEGA324P, 2 SRAMs, switching logic and delay lines for NTSC colour generation. It had the nice feature that it could switch which SRAM was connected to the CPU to achieve a hardware based double-buffered frame buffer. I started thinking how it would be neat to use a VGA output since VGA is simple to generate. I wanted to have a widescreen 16:9 resolution so that my pixels would be square on any modern TV. I settled on 480x270 which is nearly 16:9 and fits in a 128K SRAM. I progressed to a reasonably advanced state with the circuit and PCB layout. My design had two AVRs each with their own SRAM. They would simply take turns rendering. Another goal was to prototype at home and this meant I wanted a single-side board that I could make on my Zen Toolworks CNC router. This constraint basically killed this design. Well, in theory the design was sound but in practise it killed my patience due to the complexity involved in making changes. 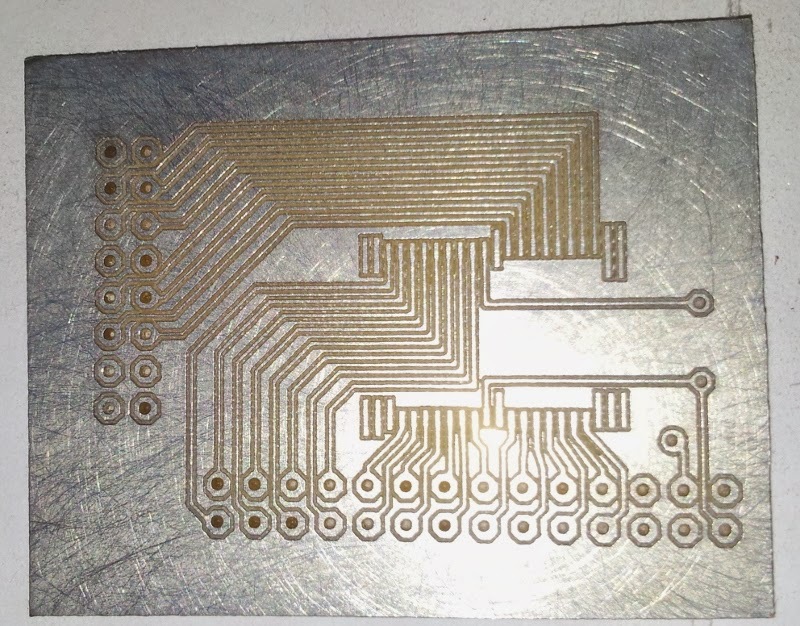 For those interested, I used the following probing software with my Eagle, PCBGcode and LinuxCNC setup: AutoLeveller. It is a terrific piece of software. 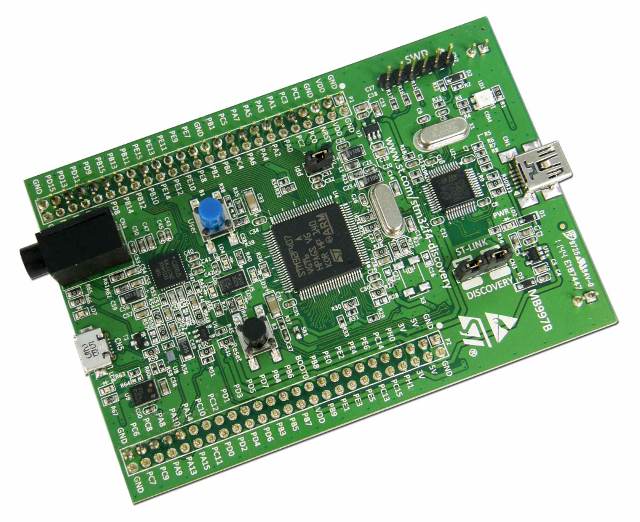 The board above took a 10ns ISSI 512KB SRAM in a TSOP-44 package. I think the board turned out really well. I soldered it up, plugged it in and toasted both my SRAM and a couple of pins on my FPGA. That is what happens when you have a solder bridge underneath the SRAM. I should have checked it I know. I didn't. Anyway I ordered another FPGA board. Anyway, it was time for the wheels to fall off this idea too. So, how did this one fail? 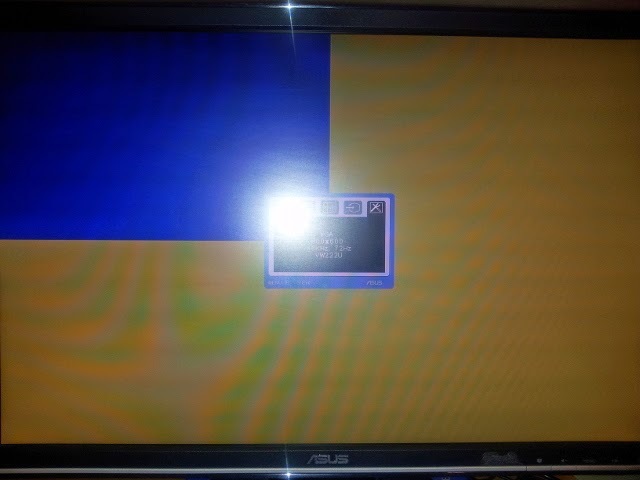 I changed the timings to generate my desired 480x270 mode and plugged the contraption into the VGA port on my TV. The result: NOTHING. So it turns out that TVs are far more pickier about modes that PC LCD monitors. Both my Sony LCD and Pioneer Plasma will accept 640x480, 800x600, 1920x1080 and other popular modes. 480x270 didn't work on either. I decided at this point to have bit of rest. About mid-2014 I started becoming interested in the Uzebox and started wondering if I could do something similar. The Uzebox is game console. It was around this time that I started becoming interested in retro gaming and the Uzebox is all about retro gaming. It still amazes me that Minecraft (well Mojang) was sold for $2.5 billion to Microsoft . Minecraft had pixelated graphics by design. Pixel art can be very compelling clearly and I think that same spirit is found within the amazing Uzebox community. Go and check out the Uzebox Forum - amazing stuff going on in there. Must have sufficient resolution to be fun on a 42-inch screen but not too high that it isn't fun to make graphics for. Must support audio output of some form. Must support the ability to execute from RAM. The last requirement gives me the ability for the console to still act as a general purpose computer. I still haven't given up on that. The Uzebox uses a Analog Device AD725 PAL/NTSC encoder chip to produce a 4:3 video signal from the AVR. I wanted to do a 16:9 widescreen mode but I remembered that the first DVD players (pre-HDMI) supported widescreen modes over composite video. I dug into it the timings more and then realised that because PAL is analog, I can push out as many pixels as I like per line to achieve a widescreen mode. Well, you are limited by the bandwidth of the AD724 and the TV's decoder though. In practise I think this is around 4-5 MHz for PAL so my mode is achievable. Essentially a 8-10MHz pixel clock is the upper limit. In another post I might elaborate on the why the pixel clock can be double but take my word for now. 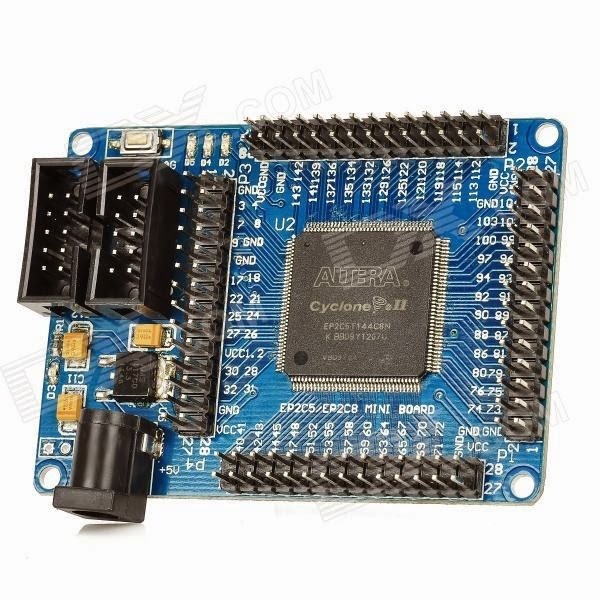 I started to look at other modes that might fit nicely in a PAL timing window and found that 416x234 required a nice 8MHz pixel clock that is exactly half of an Arduino clock frequency. I had an Arduino sitting around so I though I might hook them up. Unfortunately I couldn't work out how to achieve 8MHz with an external SRAM. I felt the Arduino's 2K RAM wasn't enough to make the kinds of games I wanted to make. Unfortunately there isn't enough time to address an SRAM and read data from it during scan out.